Three ambulances have been destroyed in a fire outside a hospital in Surrey. 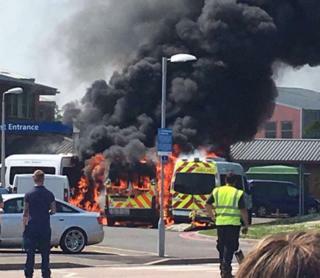 The blaze started in a parked ambulance outside the east entrance of East Surrey Hospital in Redhill, before spreading to the other two vehicles. Huge plumes of black smoke could be seen rising into the air at the height of the fire. Surrey and Sussex Healthcare NHS Trust said there were no patients involved and everyone was safe. The hospital was closed to emergencies following the incident, with patients being diverted through the South East Coast Ambulance Service. Fire crews, who were called out at 14:20 BST, were able to bring the blaze under control. Michael Wilson, chief executive of the trust, later said: "The hospital is fully open and operational. "Grateful thanks go to our staff and the fire, police and ambulance teams for their quick response."